Why I read this book: I think I put it on my To Read shelf after seeing it (or its sequel) in a Goodreads Giveaway. I have a deep love affair with ancient rome. Maybe it has something to do with my name, but ever since I had the chance to study Latin in high school, I have felt a connection to the long past civilization. So when I saw this book, I was intrigued. Mistress of Rome huh? And the cover? So appealing. So I bought it. It sat in my TBR pile for awhile but I eventually picked it up. The didn't put it down for the next 48 hrs. Thea is our main heroine. She is not a Jewish slave brought to cater to the whims of the patricians in Rome. We follow her story as she becomes involved with Arius, the reluctant but awesomely good gladiator. And that is pretty much all I am going to tell you for a summary. Because I knew close to nothing about what was going to happen next and loved when I was hit over the head with a plot turn. This book was really engaging. It took me back into a time where people watched people die for entertainment. Where there was barely a such thing as childhood, let alone "young adulthood". Quinn really weaves the details of everyday life together in such a way that it is easy to imagine. The characters are engaging and believable and she actually throws in some real historical figures into the mix. While there are more to this Rome series, this book stands well on its own. In fact if I never picked up the next two (which I probably will eventually) I would be happy with the feeling that Mistress of Rome left with me. So if you enjoy Rome and good historical fiction with a good balance of romance, adventure, drama and your healthy dose of crazy, give this book a try! I'm glad to see this review! I enjoyed this book in some ways but I think my overall take was different than yours. However I loved the concept and would love to see more fiction set in ancient Rome. Thanks for bringing more attention to it. Happy reading! I'm so glad you enjoyed it! I picked up Daughters of Rome a couple of weeks ago :) Thanks for the review! I've seen this book around but have never really had an interest in ancient Rome as a historical fiction setting, however you might have changed my mind. Mistress of Rome sounds very interesting! Thanks for the Review. Didn't put it down for 48 hours? Sounds like a great book to me! Ooooh, I am definitely going to read this now! Awesome review! This is such a gorgeous cover. 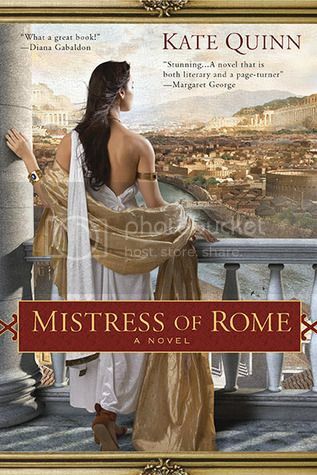 I love stories about Rome, so I'll have to add this one to my TBR list. Thanks for the recommendation! I love the book cover. Its so beautiful....you almost want to know what is going on in her mind...sure to be read soon! I'm so glad to hear you enjoyed this one! I love ancient history, too, and this one has been sitting for quite a while on my TBR pile. This sounds like a great book! I will have to see if my library has it.